As you may have heard, our family has been blessed with a new puppy. As you probably have not heard, puppies require 7AM walks to do their business, and puppies don’t care if you’re tired, upset, frustrated, or angry. At 7AM on Sunday, I exited the house with the dog, and promptly ran into another entirely too happy dog owner walking his dog. My inner Clark Kent-ish personality jumped to the front, somehow pasting an easygoing smile on my face, packing away all the frustration of Saturday’s game as I made smalltalk about being a dog owner, the same smalltalk that dog owners have probably been making about dogs since dogs showed up in our caves thousands of years ago. It wasn’t a bad conversation – I didn’t regret having it, even though it was unmemorable. I was glad to share some goodwill with the neighbors. But it did demonstrate to me what sports fans have to do in this age when our teams are struggling. You have to be able to put your fan alter ego away to get through life. You’re a typical Lehigh fan. You know Lehigh is playing James Madison next weekend. You know that the Dukes have been a pretty good football team over the years. After reading this fantastic Lehigh blog you found, you learned of that national championship they won with QB Justin Rascati, after that championship run that started with converting that 7th-and-goal against the Mountain Hawks in the playoffs. 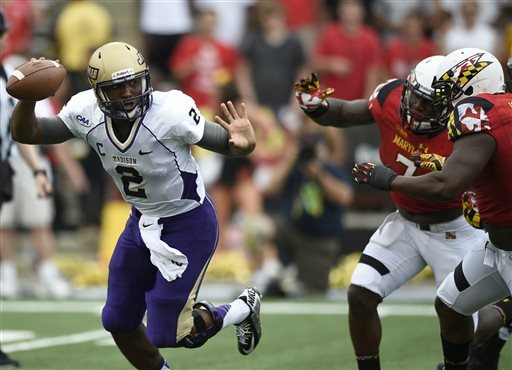 But then you read a recap of James Madison’s game last weekend against Maryland, and then you don’t know what to think. The Terps are a FBS team, playing their very first game as a member of the Big 10 against the Dukes, coasted to a 45-0 lead against James Madison and were never really threatened. You read about mistakes, penalties, scoring only in garbage time. You might have caught some of the BTN broadcast, showing a sullen QB Vad Lee angry at himself after his second interception. What’s in that game? Does it mean anything, in the grand scheme of things, in regards to Lehigh’s chances this Saturday? Once upon a time, Lehigh’s football team was many preseason pundits’ consensus No. 1 in the Patriot League. It wasn’t even a question. Sure, some of that was due to the fact that Fordham, now for the first time in years an full, card-carrying member of the Patriot League, was ineligible. But in 2010 and 2011, Lehigh was the undisputed king, with wins over their Rivals, undisputed Patriot League championships, and even playoff victories against Northern Iowa and Towson. This season, it’s a new team with a dynamic offense and a team loaded with talent that is the undisputed champion going into the 2014 season. With one of the best FCS quaterbacks in the nation, QB Michael Nebrich, and a talented defense backing them up, the Rams now have the targets on their backs. And if Lehigh hopes to stand a chance to challenge the new kings of the hill, they will have to improve immensely on the defensive side of the ball. With the secondary out of the way, it’s time to focus on Lehigh’s spring roster battles as they relate to the rest of the defense, the linebacking unit and starting defensive line. On the coaching front, rabid Lehigh football fans will recognize the two position coaches at both linebackers and defensive line. Both coached alongside of current head coach Andy Coen during two of the Brown and White’s best-ever defensive seasons in 1998 and 1999. Joe Bottiglieri was the defensive coordinator for the legendary 1998 team, which went 11-0 in regular season play and shocked the world by knocking of Atlantic 10 champions Richmond in the first-ever playoff victory for the Mountain Hawks since Lehigh joined the Patriot League. Along with current defensive line coach Donnie Roberts, Lehigh’s defense held the eventual I-AA champions, UMass, to 26 points and putting Lehigh in a position to win with a minute left in the quarterfinals. This season, Coach Bott and Coach Roberts will try to recreate that same magic with this year’s team. Below the flip, enjoy this week’s “LFN Players of the Week” for the Georgetown game. You’ll notice that there’s a lot of nicknames below after last weekend’s 45-24 win over Georgetown. 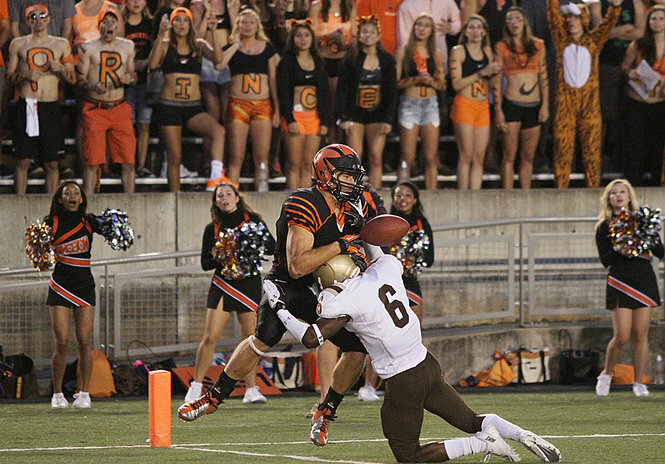 Below the flip, enjoy this week’s “LFN Players of the Week” for the Princeton game. 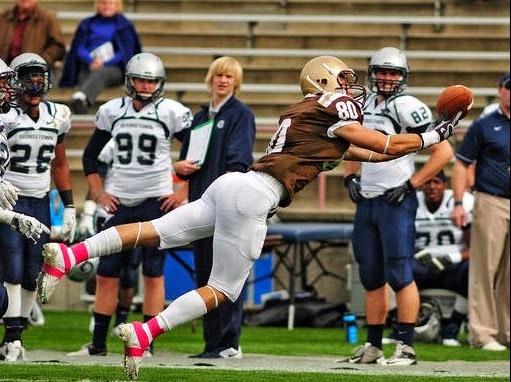 Last week, Lehigh beat Monmouth 28-25, partially thanks to a crazy blocked punt that landed behind the line of scrimmage and was caught in mid-air by senior FB Zach Hayden, which he advanced for 37 yards and set up the winning score. After that game, I asked head coach Andy Coen whether Lehigh fans might be able to expect this type of cardiac win every week. On a warm Saturday evening in late September, Lehigh pulled the exact same rabbit out the hat that the pulled in the first two games of the year, falling behind 22-3 at halftime before rallying to score 26 points in the second half to beat a tough Princeton team.